WHAT FINALLY BROKE me was the recipes. On July 1, I abandoned Google search and committed myself instead to Bing. I downloaded the Bing app on my phone. I made it the default search mode in Chrome. (I didn't switch to Edge, Microsoft's browser, because I decided to limit this experiment strictly to search.) Since then, for the most part, any time I've asked the internet a question, Bing has answered. A stunt? Sure, a little. But also an earnest attempt to figure out how the other half—or the other 6 percent overall, or 24 percent on desktop, or 33 percent in the US, depending on whose numbers you believe—finds their information online. And Bing is big! The second-largest search engine by market share in the US, and one of the 50 most visited sites on the internet, according to Alexa rankings. (That’s the Amazon-owned analytics site, not the Amazon-made voice assistant.) I wanted to know how those people experienced the web, how much of a difference it makes when a different set of algorithms decides what knowledge you should see. The internet is a window on the world; a search engine warps and tints it. There’s also never been a better time to give Bing an honest appraisal. If Google’s data-hoovering didn’t creep you out before, its attitude toward location tracking and Google+ privacy failings should. And while privacy-focused search options like DuckDuckGo go further to solve that problem, Bing is the most full-featured alternative out there. It’s the logical first stop on the express train out of Googletown. A minor spoiler: This isn’t an excuse to dunk on Bing. It’s also not an extended “Actually, Bing Is Good” counterpoint. It’s just one person’s attempt to figure out what Bing is today, and why. Let’s start with the Bing app, technically Microsoft Bing Search. This almost certainly isn’t how most people experience Microsoft’s search engine, but the app does have over 5 million downloads in the Google Play Store alone. People use it. Besides, what better way to evaluate Bing than drinking it up in its most distilled form? Bing offers a maximalist counterpoint to the austerity of Google, whose search box sits unadorned, interrupted only for the occasional doodle reminder of a 19th-century physicist’s birthday. When you open the Bing app, the act of searching is almost incidental. A high-resolution, usually scenic photograph sweeps the display, with three icons—a camera, a magnifying glass, and a microphone—suggesting but not insisting on the different types of search you might enjoy. Below that, options: Videos. Near Me. News. Restaurants. (Side-scroll a bit.) Movies. Music. Fun. Images. Gas. These are the categories Bing considers worthy of one-tap access in 2018. And honestly, why not? I like videos. I like fun. What lurks behind those taps, though, varies wildly in usefulness. In mid-August, a dive into Videos yielded, in this order: “Crowds in France React as France wins the world Cup,” “Genius sport hacks. ??? ?,” “Melania Trump Responds to Omarosa’s Book,” “everything is terrible so here’s a baby lion cub learning to roar,” and “WT actual F.” It’s a strange mix, like time-traveling to your lonely uncle’s Facebook News Feed six weeks ago. Music shows a grid of “trending songs”—or swipe right for “trending artists”—which you can tap to see lyrics. 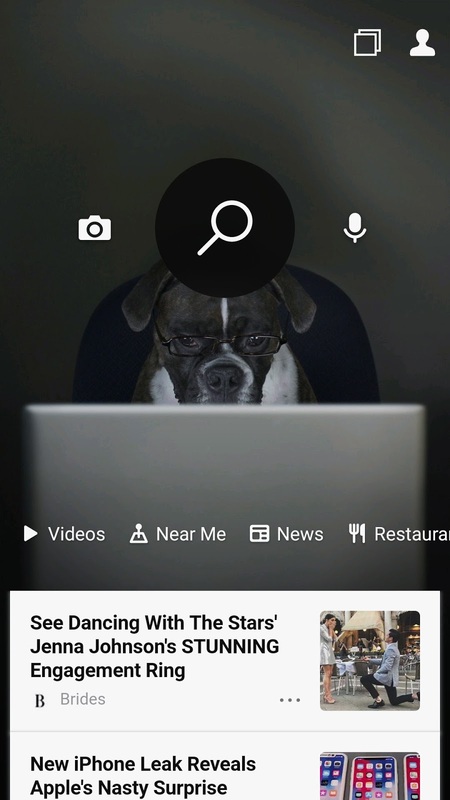 Tap again, and Bing takes you to YouTube (on the web, not the app; Bing does not like bouncing you to apps, which turns out to be more annoying than you’d think). You can also just scroll through Bing search results for a given song, most of which are also lyrics. Near Me, on the other hand, offers some genuinely interesting options. It lists the standard collection of restaurants and local attractions, but also includes “Deals Near Me,” powered by DealCatcher, which alerted me that if I downloaded the Wendy’s app I could partake of a buy one, get one free offer on chicken tenders a mile up the road. (I did not.) Near Me also features maybe Bing’s neatest trick. If you tap the blue dot that says "360º," Bing activates your rear camera and overlays the location and distances of various nearby establishments on whatever you point it at. It’s like navigating an open-world videogame, except it’s the actual open world. 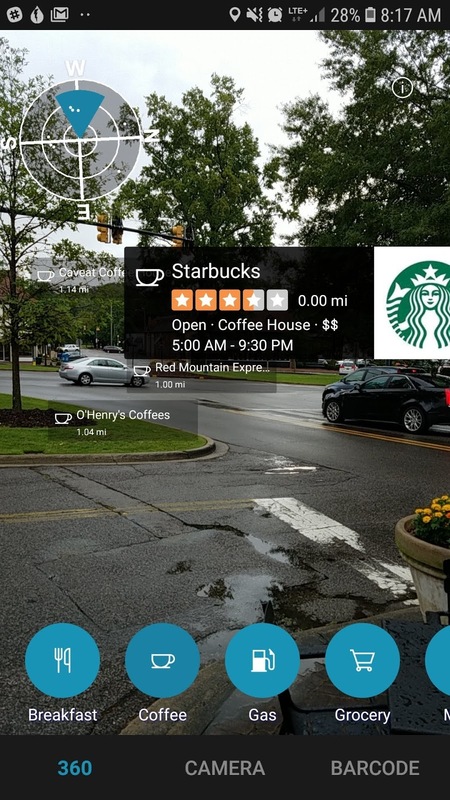 Bing's 360 "Near Me" map is a genuinely fun, useful feature (even if the Starbucks is technically behind me). And then there’s Fun. Fun! What to say about Fun, a parallel internet universe where casual gaming on AOL never died. You can play Chess or Sudoku or an online jigsaw puzzle. You can take a celebrity quiz or a news quiz or a geography quiz. There’s a matching game and a Rubik’s cube. You can play something called “Put in order,” which I imagine is pretty straightforward. And so on. A Microsoft spokesperson says Bing deploys a combination of "algorithm signals" and human editors, who take into account both live search activity and real-time news events. I think it’s important to establish that at no time did I stumble upon any of these infobursts in the natural course of searching. If I weren’t actively poking and prodding Bing’s features, I likely never would have found them. Which reveals less about how the features work than what purpose they serve. Bing appears to want, both on desktop and in its app, to be not just a search engine but a portal. That makes sense if you want to differentiate yourself from Google, but less so when you remember that it’s not 2002. My searches don’t happen in an app or on a website, they happen in a URL bar. As they should—the act of searching is a constant sidebar to whatever it is you’re actually doing. Bing wants to be a destination, but search is a thruway. Spending even a second longer than necessary there is like getting on the New Jersey Turnpike to visit the Clara Barton rest stop. Similarly, I did not much use Bing Visual Search, Microsoft’s answer to Google Lens, although I can confirm it accurately identified an Infiniti QX SUV that I passed on the road. Ditto Bing’s voice search. I tested them both out of due diligence, and they seem fine. But forcing myself to use the Bing app mostly reminded me that search apps—no matter who makes them—only add a layer of friction to the ideally instantaneous process of think —> search —> know. Google obviously has an app as well, which also shoves weather and headlines underneath a search bar, and offers voice search. I don’t use it much, either. But at least when I do, it knows enough about me, through years of my blindly handing over information and interests to Google, to serve up a tailored experience. Google knows I’m an Orioles fan, so the app shows me scores during the season. (When in doubt, they lost.) It knew I was going to Los Angeles over Labor Day weekend, so it linked me to a Fodor’s travel guide. Maybe, given enough time and attention, Bing would have that same level of insight into my online psyche. But I’m not prepared to give it that long, because it hasn’t given me a reason to. And because it does some things that drive me nuts. I’d originally hoped to string insightful or hilarious anecdotes throughout my Bingapalooza, but I quickly realized something I should have known all along: Search is search is search. Which is to say, if you want to find something online, Bing will almost certainly get the job done. Would you have found it faster on Google? Would another search engine show you the perfect link first instead of fifth? Maybe. For the bulk of my Bing expatriation, I avoided Google entirely, but I switched to Google on mobile toward the end. I've stuck with Bing on desktop. I’d like to say it was for comparison’s sake, but mostly it's because I still haven't gotten around to changing the settings on my laptop. For the most part, Bing’s results were never so wrong that I had to switch back. There's one consistent exception to this, which I’ll write off as a narrow use case: Bing is terrible at finding specific WIRED articles from the past few years, something I need to do daily in the course of writing and editing stories. Even specifying the writer, the site, and a few words from the headline wasn’t enough at times. Help. In some ways, I actually preferred the way Bing coughed things up. Anecdotally, it feels less burdened with ads. It also doesn’t pluck nearly as much info from sites, strip them of context, and present them as search results. (Bing does do this occasionally, with the kind of mixed results seen below.) I know Google does this to save you time, but its “featured snippets” function has presented outlandish conspiracy theories as facts and has helped drive sites out of business. Those aren’t the kinds of efficiencies I want to enable.